We can say, without any exaggeration that they were the world’s favourite tango-couple for a long time. We could easily name some beautiful tango performances of theirs. All their steps were beautifully structured, often choreographed. Their musicality is simply fantastic. Geraldine – despite of her parents being active tango dancers-teachers up to present day – ran away from home at the age of 16 to become a tango dancer. Additionally Geraldine and Javier played roles in many tango movies together.Let’s take a look at some of their shows. Those who have seen this one will not mind seeing it once again. 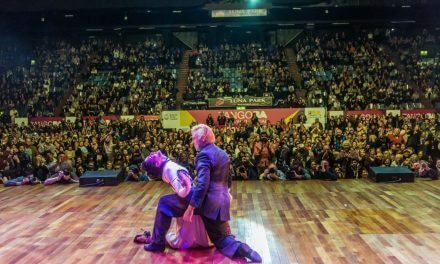 And those who have not – hold on to your chair – this is one of the world’s most beautiful tango performances! Hold on! It isn’t over yet. One of the world’s best milonga show. The way they dance on stage shows their versatility! Life unfortunately has parted their ways. This shocked the world’s tango communities. Many articles and speculations emerged, trying to find out the reasons of their split-up. Geraldine Rojas now performs with Ezequiel Paludival, her husband and Javier Rodriguez keeps changing his dance partners! In this interview with Geraldine and Ezequiel Paludi you can find out more about why the famous couple split up. They were so popular together that there is a community on facebook that wants Geraldine and Javier to dance together again! Further videos and performances here.